Jim Olson, M.D., Ph.D., leader of the project, pediatric oncologist at Seattle Children’s Hospital, and clinical researcher at Fred Hutch, named it after a spirited, red-headed girl named Violet who died at age 11 from an inoperable brainstem tumor. Before Violet died last year, she and her family requested her brain tumor be used to create research tools that could be shared with scientists worldwide to help kids who are diagnosed in the future. That spirit of generosity led to the most exciting scientific project I’ve worked on in my life. It was only fitting that it be named after Violet. I knew that we were going to do this in her spirit, memory and honor. Project Violet aims to develop a fundamentally new class of anti-cancer compounds called optides (optimized peptides found in nature) — chemical templates from organisms such as violets, scorpions and sunflowers — to attack cancer cells while leaving healthy cells untouched. Traditional drugs are often small molecules. In contrast, optides are protein peptides — short chains of 30 to 40 amino acids in length that can bind to specific targets in cells. Unlike antibody therapeutics, optides are small enough to get inside cells and can reach difficult, three dimensional targets that can be inaccessible to conventional small molecule drugs. Fred Hutch scientists have discovered how to create thousands of optide variations (they report they can now create 10,000 optides in three weeks). The small team can produce the drugs on campus instead of having to use an expensive contract manufacturer. Now the race is on to identify the ones that can shut down cancer or paralyze diseases that affect human patients. Viable drug candidates will be handed off to a commercial partner, likely Blaze Bioscience (founded by Olson), for further development. The Hutch recently amended its collaboration with Blaze Bioscience; the company has the exclusive option to license optides developed through Project Violet . Project Violet is crowdfunding the research in a unique way: donate $100 and adopt a drug. According to the website, you can “select a drug candidate to call your own, join the drug discovery process and try to pick a lifesaving winner.” It’s a rare opportunity to share in the challenges and triumph of drug discovery from initial research through to FDA approval. Donors will receive an illustration of their molecule, and they will be able to follow periodic blog updates from researchers who will share some of the problems and successes in the early phases of drug development. In the event that an adopted molecule fails, the donor can get switched to a new one. Dr. Olson’s team has thought extensively about how to keep donor interest up over time, and are building in options to maintain engagement. In addition to cancer, in this very first phase of Project Violet, the optides are also being tested to prevent stroke, brain and mental health disorders, and a certain type of autism. Watch Dr. Jim Olson’s TEDxSeattle talk (below) and, to encourage those who care about cancer patients to spread the word, the Washington Research Foundation (WRF) will donate up to $50,000 ($10 for each view) toward cancer drug discovery. In the talk, Dr. Olson discusses how he was inspired by individual patients that he cared for, and how this inspiration led to a whole new platform of drug candidates that come from violets, sunflowers, spiders and scorpions. 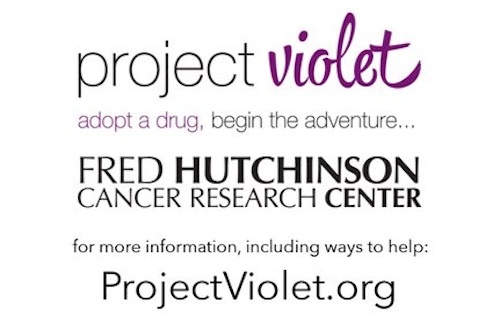 At the Project Violet website, you can adopt a drug candidate, gift a drug candidate or make a donation. How a little girl with brain cancer inspired ‘citizen science.’ Fred Hutchinson Cancer Research Center. 2013 Aug 12. Blaze Bioscience and Fred Hutchinson Cancer Research Center Enter into Collaboration and Option Agreement in Support of Optides Discovery Program. Fred Hutchinson Cancer Research Center. 2013 July 3.